Stephen Luby, a professor of medicine at Stanford University, is an expert in sanitation in South Asia. His seminal article in The Lancet in 2005 which was a randomised controlled trial on the significant benefits of soap in decreasing infections in the slums of Karachi is one of the most elegant pieces on public health from the region. The good doctor is now helping out with another major study to see the effect of sanitation on the growth of children in Bangladesh, Kenya and Zimbabwe. One of the reasons that has prompted this study is very relevant to Nepal and India where there is phenomenal open defecation. It is now believed that poor sanitation leads to stunting of growth in children. Luby’s study deals with trying to determine the magnitude of the effect of poor sanitation on growth. Stunting may lead to not only shorter stature, but the children may also be mentally deficient. Data is beginning to show that despite a reasonably good diet, Indian children are more stunted than their counterparts in sub-Saharan countries like Somalia and the Congo where nutritious food may not be as readily available as in India for children. The one significant difference in Indian children is that they are brought up in an environment of open defecation, unlike in Africa. Indeed, half of India’s population urinates and defecates outside, and by all accounts Nepal cannot be far behind. In the Ganga in Varanasi where many pilgrims bathe, a stream of 20 million gallons of sewage flows directly every day into the river just above the bathing ghats. Many pilgrims bathe in this water and brush their teeth in nearby outlets. In a smaller way, the polluted waters of the Bagmati and Bishnumati witness similar activities. 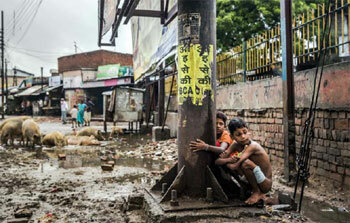 Infections like hookworm, amoebas, or typhoid triggered by poor hygiene due to open defecation so debilitate the child that the body has no strength left to power and develop vital growth. In other words, the child’s body is so busy fighting infections and resulting inflammations that all the important nutrients are diverted away from the vital activity of physical and mental growth. Children are therefore stunted and malnourished. In fact, now there is evidence to show that malnourishment during childhood not only predisposes the child to infections, but as an adult the child will also be more susceptible to non-infectious diseases such as heart disease, diabetes, and stroke – a double whammy. But what is becoming clear is that just building new toilets may not be the answer. People’s desire to defecate in the open is so strong in this part of the world that the government-built toilet outside become used for other “more useful” purposes like storing fodder for cattle. Clearly this is a cultural problem and it doesn’t have a purely technical solution. There is a parallel here with clean stoves. In order to decrease indoor air pollution which leads to many problems including lung and heart diseases, Nepal has for decades tried to introduce clean stoves to replace traditional firewood stoves for cooking purposes. Many of these smoke-free stoves are not used after installation as people revert to traditional chulos that emit soot and smoke inside homes. Cultural factors are at play here, too. The Nepal government has a target to make all homes equipped with smoke-free stoves and latrines. But it may be important to also continually emphasise health education, and study the cultural reasons why just building a toilet or introducing a clean stove will not guarantee acceptance.